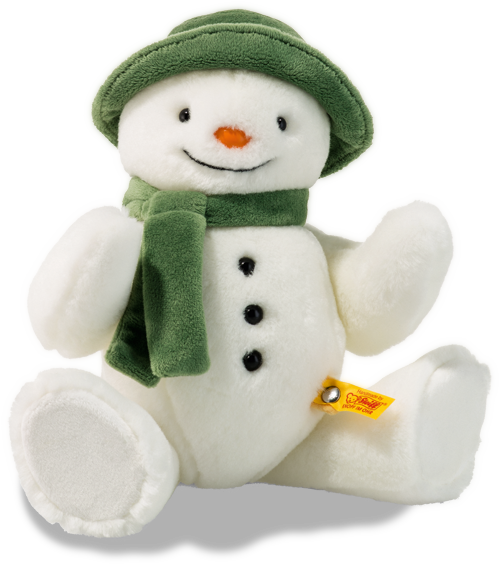 Steiff character teddy The Snowman, 690181 ~ Free Steiff Gift Box! "Sitting down for a rest?" Steiff bear - The Snowman - is a lovely piece from the interpretation of the enchanting tale – The Snowman TM by the author Raymond Briggs – soft, cuddly and complete with his tangerine nose! He is made from white cuddly soft plush and is fully jointed (means legs, arms and head are moveable) and has a happy long black mouth and is designed with black shiny eyes and matching three buttons on his tummy! Finally he is wearing a soft fir green coloured big hat and scarf. Snowmen do not have ears so Steiff have embroidered their famous button on the bottom of his tummy. Surface washable, and is suitable for all ages.